Firms often struggle to find effective strategies to communicate with staff. Just what is the best way of dealing with the communication aspects of a cost cutting exercise or a potential merger? Given the likely anxieties, do you keep it quiet or tell people? If you tell people, what do you say, how do you say it and through which channels? Tell & Sell: Partners communicate a more limited set of messages, first telling employees about the key issues, then persuading them of the wisdom of their approach. More limited information is put out. But communication is still seen as a top down priority. There is not much exploration of the thoughts, needs or anxieties of others. Underscore & Explore: Management focuses on developing a few core messages clearly linked to organizational success, while actively listening for potential misunderstandings and unrecognized obstacles. This is a more sophisticated approach with key messages being underlined to ensure they’re fully understood. Also time is given to discussions. Communication is seen as a two way street. Identify & Reply: Partners identify key employee concerns and then reply to them. Less information is disseminated using this strategy and it’s probably less effective because management is not fully in control of the process. What if staff members don’t ask questions? 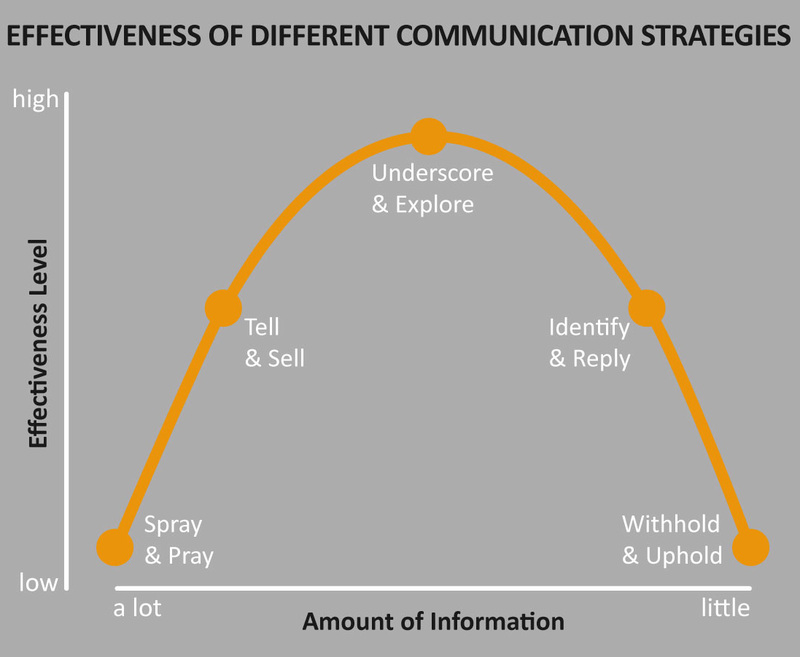 Another interesting area to explore is which communication channels are best to use. Law firms use email far too much for communication on important projects. Surely there’s a better way of cascading information down the hierarchy and using team meetings more? Then there’s posters, workshops, the intranet etc. Finally, management seem to think that once you’ve told people, they know. The truth is that we’re all bombarded with information and need to be told several times before the message sinks in. Or is that just me? This entry was posted in Business Development and Selling. Bookmark the permalink.